There will be no late seating for this performance. This performance contains instances with haze. 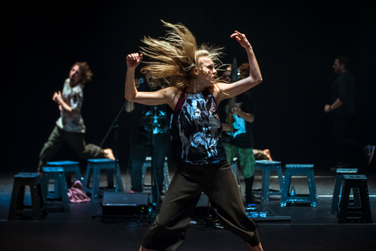 Two of the world's leading dance companies, Dancenorth and Lucy Guerin Inc. collaborate with tour-de-force Indonesian music duo Senyawa in this cross-cultural event. Drawing influences from both Indonesian folk ritual idioms and western metal bands, Senyawa's unusual sound reinvents the Javanese spiritual tradition of entering trance through dance and music by fusing hand-made electric string instruments with operatic melodies, metal vocals and contemporary choreography. Ensemble members will conclude the performance by selecting audience members to co-create an unparalleled shared experience. This performance of "Attractor" by Dancenorth/Lucy Guerin Inc. is supported in part by an award from the National Endowment for the Arts and the Embassy of Australia.